Most Romans dressed up in long, flowing pieces of material. Everyone wore a knee-length dress called a tunic. It was held at the waist by a belt. Women wore a dress called a stola over the top of the tunic and sometimes a big shawl too. Rich women had slaves to help them do their hair and make-up. They: wore lots of jewellery, put chalk on their face and painted their lips red. 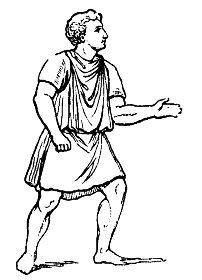 Important Roman citizens wore a woolen robe arranged in folds called a toga to look smart. Only the Roman emperor wore a toga with a purple stripe around the hem.